Meat Ball Curry, known as Almôndegas com Molho de Caril, is a signature Portuguese food which draws aspects in the style of cooking from both Portuguese and Goan cuisine. 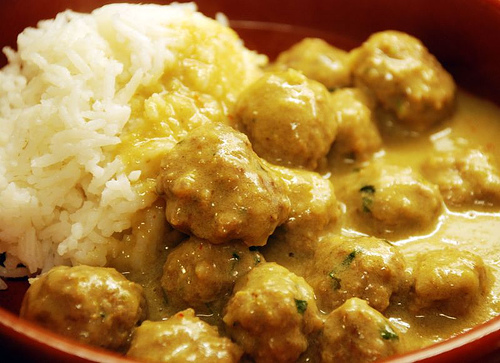 The tender ground beef combined and cooked with the right amount of Portuguese style spices makes for some savory and delicious meat balls, which is then served in an intensely flavorful curry sauce. This dish is perfect for serving with some rice on the side to properly enjoy the sauce. 1) Grind the meat with 3 tablespoons of the curry powder until it is even and consistent. Mix in the bread crumbs, cilantro, and salt and pepper to taste. Mix it well. 2) Form the mixture into medium sized balls. 3) Heat the olive oil in a saucepan and saute the onion until caramelized. 4) Add the curry leaves and the remaining curry powder, let them stir-fry for a few minutes. 5) Add the tomato and saute for a few minutes until soft. 6) Add the 2 cups water and vinegar and bring the mixture to the boil. Simmer for 15 minutes on low heat. 7) Add the meat balls to the saucepan and cook for 10 minutes until they are cooked. 8) Boil the cup of rice separately. 9) Once done, pour the meat balls with the sauce along side the rice. Serve.